Ideally a telescope mount would be able to track perfectly. Sometimes poor alignment, wrong speed, or a worn gear will affect the telescope mount tracker and give inaccurate results. The goal of this project is to design a sun guider to make tracking the sun faster, easier, and more accurate and convenient. A Losmandy GM-8, German equatorial telescope mount, was used to track the sun. Four photodiodes arranged diagonally with a pole in the middle was used as a sensor, which was placed on the mount. The photodiodes output certain voltage amplitudes due to the intensity of light that strikes them. The voltages were amplified by a quad sum and difference amplifier to enhance the signal-to-noise ratio. The voltages are read by a LabJack, a USB/Ethernet based measurement and automation device, which sends information to a computer program. 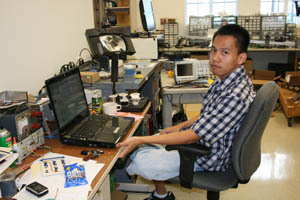 The computer program commands LabJack to output digital signals to control the drive system of the telescope mount. Using the program, the sun tracker setup can work autonomously or be operated manually. It can also be coupled with wireless routers for remote access. When tracking the sun, the tracker system provides a solution for tracking errors, ease of use, and flexibility. By observing the solar atmosphere, we can finally understand why it is hotter than the sun’s surface. The South Pole Project uses new telescopes that use magneto-optical filters to allow observations of calcium, sodium, potassium, and helium spectral lines in the solar atmosphere. My goal was to make a temperature sensor board for one of the telescopes. After reading and analyzing the circuit schematic, I soldered the wires, connectors, and tested the board for opens or shorts before soldering the components to their placements. The Temp sensor board’s job is to amplify the signals from the sensors and send the amplified signals to a Labjack. The amplification is necessary to get desirable signal-to-noise ratios, which in turn provide more accurate monitoring of temperatures in the telescope.